There's a saying along the lines of not knocking something until you try it. Too right. 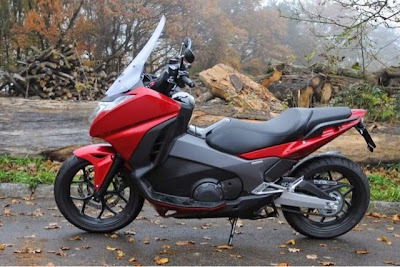 I set out today to take a 2015 Burgman 650 for a ride and decided to try out a red 2015 Honda Integra instead. Thing is, it looks like a scooter, but it's so not. It is a pretty authentic automatic motorcycle... complete with clutch and all. Packed with 750cc, it was the deep growl at the engine start up which changed my mind from taking out the Burgman. The Integra sounded like a massive truck engine compared to the Burgman's purr. I mounted it. Firstly, let me clear the negatives out of the way. Number one: no real step through. 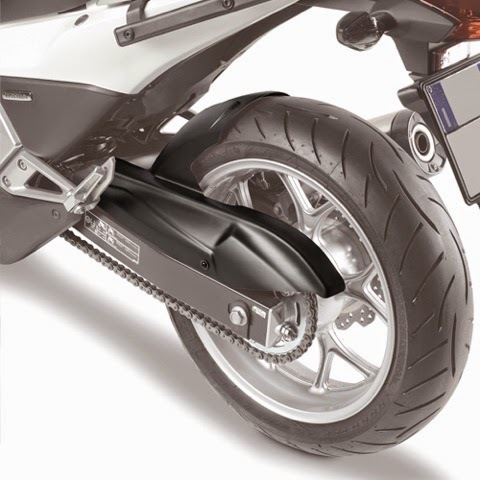 Although not impossible to get on leg-over front-ways, it's the kind of machine you bend your right leg and throw your knee over standing at the left of the bike facing it. Number two: no massive storage. In fact, the under seat won't even store a helmet. But really, for storage, there's nothing two nice panniers and a top box can't fix. (See stock photo below). Besides, there is a handy compartment at the front left just under the handle bar... big enough for a smart phone. Only just... and not an iPhone 6 plus size one either. Number three: no special standard features like heated grips, retractable rearview mirrors, and sliding windshield. Nope. None of that. 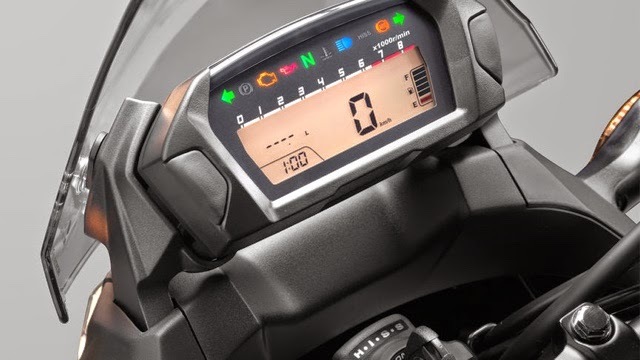 What you will get is a fully digital dashboard with large numbers indicating speed and a smaller set displaying which gear you're currently in. This unit, my friends, is not a scooter. 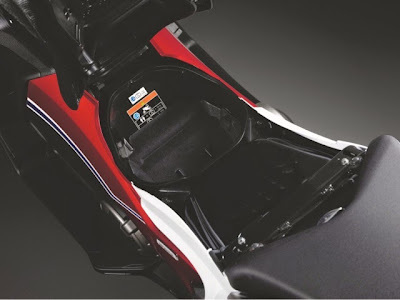 This is a motorcycle cloaked in plastic bodywork. 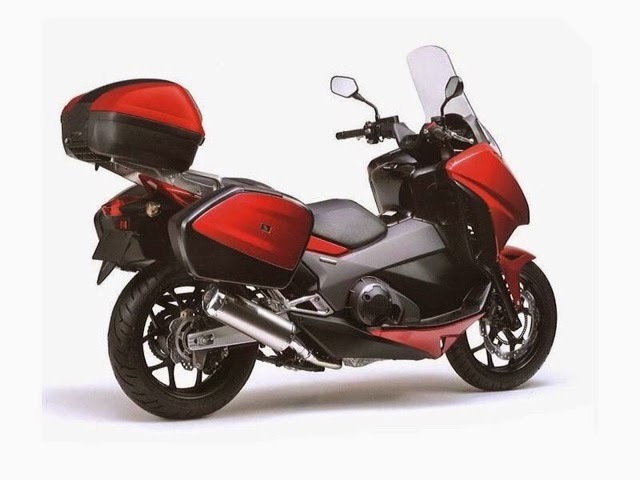 In fact, the body frame is precisely as the Honda NC750 and its DCT version. Very same bike. Engine in front. Large wheels. Chain drive. ABS and disc brakes. (The ABS was awesome, by the way). The bike offers two modes of riding: auto or manual. Auto is basically twist-and-go with a drive or sport option. You really hear and feel the gears changing up and down, too. Sport option delays gear change longer. Manual mode is handled by two levers on the left handle for gear change up or down. Brakes are on the handlebars: right for front, and left for rear. No right foot braking and there's a parking brake which when engaged, keeps the unit from rolling away. Riding it offered so much stability because of the wheel size and centrifugal balancing of the weight distribution. It's a heavy bike and it sits very solidly on the road. I felt very secure on it; like there was just nothing it couldn't handle. I rode just barely turning the throttle before it hit 50 mph. Felt great. Phew! What a contender this bike is. I had no idea. 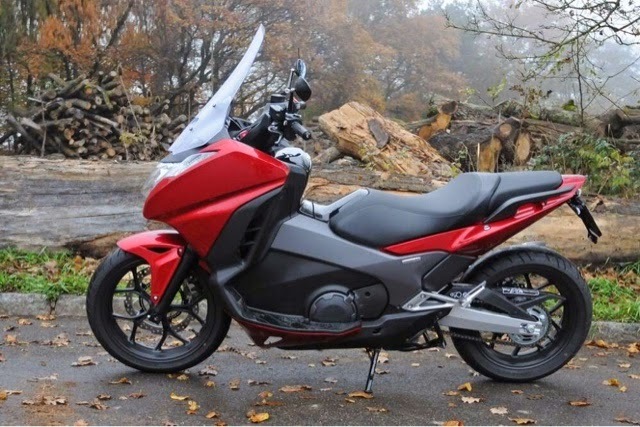 If you're looking for a motorcycle with the feel of riding a scooter, this is absolutely it! I rode with my legs extended forward the whole time. It was such a pleasure to ride that I'm doing it again next week and again the week after next. So current status is, I want one. I'm a biker myself though find it hard to believe it's a motorcycle when indeed it looks like a scooter. From a different angle it looks like a tour bike, probably a good choice for those who want to commute to work or enjoy their scooters. I was considering the Honda NC750 DCT as my next bike, but here in Florida we are not allowed to do test rides off the parking lot of the dealership (stupidest rule ever) so I've not really had a chance to ride it yet. So your review is good for me to read. Thanks for posting it. Once again a model I wasn't familiar with though something I would really enjoy. The line between motorcycle and scooter continue to blur. I'll be watching for yours to appear. Believe it or not...I found one in America. I'm giving serious thought to it. Excited for you, Robert! I'm giving it serious thought, too. Hey Kate, what part of, "it's not a scooter", didn't you understand? Hubby and I had a look at the Integra, too. But: after what felt like a gazillion test rides on various scooters or automatic gear motorcycles in the last 12 months or so, my beloved partner has settled on: a 2011 Suzuki Burgman 400. The exact same model, year, even colour than the one he owned and rode in North America. He went to Southern France with it, and back. Procured four weeks ago the bike has already racked up more than 2.500kms. When we went on vacation to the Virgin Islands they were actually renting these out to tourists. I grabbed one and it was a complete blast. I was so in love with my bike that as soon as we got home I made sure to locate one locally and bought it the following week. I use mine in town for shopping and just cruising.